Living Benefit Rider offers . . .
How can a product so simple provide worry-free living today and a tax-free legacy tomorrow? You can use the cash value to secure a loan from the company. You can use the LIVING BENEFIT RIDER* to receive a portion of the policy benefits (see example). The proceeds can be paid to you in a lump sum or as a regular monthly income. Use the payments however you wish . . including offsetting medical expenses or supplementing other benefits paid for nursing home care. * Refer to rider for details. Not available on face amounts under $50,000. 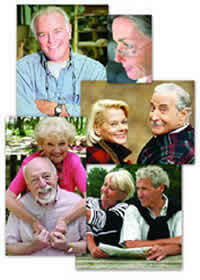 The GUARANTEED** death benefit passes to your heirs income-tax free. In most states it is not subject to probate fees and the benefit purchased is more than the premium paid. Lump Sum funded by discretionary dollars, perhaps a CD or 1035 exchange of cash value from an older policy that is putting a strain on current cash flow. Two equal semi-annual, or 12 equal monthly bank drafts. You annuitize an existing deferred annuity to redistribute the taxation of gain. ** to the extent it is not repaid, any loan against the cash value may reduce the benefit otherwise payable. Capitalization of unpaid interest on a loan may cause the policy benefits to be forfeited altogether.